MACH-XC free flow stainless steel Cat-Back exhaust kit for the 5th gen V8 Camaro Convertibles. This exhaust kit has been meticulously designed to manuver around the extra braces that the Camaro Convertible has on its undercarriage. This is a completely bolt-on kit and there are no special tools or welding required for the install, all necessary hardware is included. What the Mach-XC kit offers is a raw, deep, mean American muscle sound outside, while being non-invasive inside. Even though this car is a convertible, the special Solo designed Mach-X muffler combined with our J-Pipe technology (eliminates unwanted frequencies inside the cabin) creates a staggering difference in the exhaust note from the interior to the exterior. The magic of the Mach-XC exhaust kit will allow you to have a normal conversation inside your car while turning heads on the outside. We call the Mach-XC a "sound on demand" exhaust kit. It stays calm until you hit the gas. Depending on how you accelerate, you can play your car like a finely tuned instrument. Once you're up to cruising speed, your convertible will be "almost" stock quiet until you pull out to pass someone. This kit is designed for both the V8 Auto and Standard. The inherent trouble areas, 6th speed cruising with the Convertible Standard, and the 1900-ish RPM range with the auto have all been addressed and have no major issues. 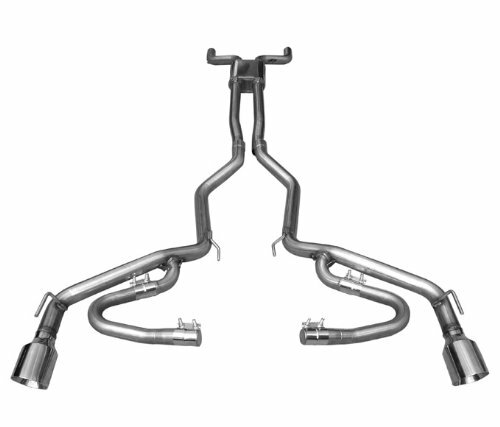 The transition between 8cyl and 4cyl on the auto's is smooth and non-invasive while the 4cyl mode is a bit gurgley and very acceptable considering you have free flow 2 ½" mandrel bent exhaust going through 4 cyl's. All Stainless steel Piping. Bolt on design for an easy installation. All parts and hardware included. No welding. Free Tee shirt with every order. Sm, Med, Lg, XL , 2XL & 3XL available. PM us your size when you order or we will include an XL. If you have any questions about this product by Solo Performance, contact us by completing and submitting the form below. If you are looking for a specif part number, please include it with your message.